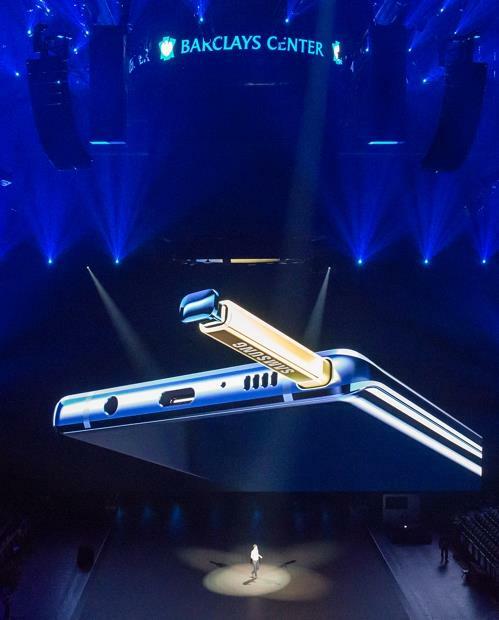 SEOUL, Aug. 10 (Yonhap) -- Samsung Electronics Co. showcased Friday the Galaxy Note 9 smartphone featuring a Bluetooth-powered pen, expanding the scope of functions provided by a stylus from taking photos to activating apps. Along with a whopping 4,000 mAh battery and 512GB storage capacity, one of the major attention grabbers of the Galaxy Note 9 is the advanced stylus. Samsung said for the new phablet, the S-pen is no longer just a writing tool, but is a means to engage shortcuts to activate applications, or turning pages of presentation slides. The tech company said if users long-press its button, the Galaxy Note 9 will activate the camera. Users can then take photos with the pen, and even change between main and selfie lenses by clicking the pen's button. Samsung said users can designate specific apps that can be activated by clicking the pen. Samsung said 11 apps, including video-sharing platform YouTube, can be controlled by the pen. The company said if the Galaxy Note 9 is connected to larger screens through the Samsung DeX system, the pen can be used to make presentations. When it comes to recharging the pen, the process is automatic if the pen is inserted back into the phone for just 40 seconds. A fully charged pen can be used for 30 minutes, or execute some 200 actuation orders. The stylus pen of Samsung's phablets has been evolving since the company showcased the original Galaxy Note in 2011. The original version came with a pen with 256-level pressure sensitivity. The tip of the pen was 1.6mm. The pen has continued to develop, with the Galaxy Note 4 already boasting a whopping 2,048-level pressure sensitivity. With the ill-fated Galaxy Note 7, Samsung introduced the pen which supported instant translation and the IP68-level resistance to water and dust, which meant the pen could endure being submerged in 1.5 meters of water for 30 minutes. Its pressure sensitivity stood at 4,096 levels, with the tip being 0.7 mm. The Galaxy Note 8 then added the live-message feature that allowed users to create their own animated GIF files with the S-pen. The South Korean tech giant said it plans to open the software development kit for the S-pen to invite more developers to join its ecosystem.